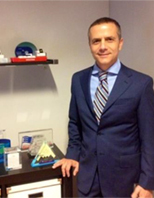 Mr. Argyropoulos is the founder of Seaborne Capital Advisors. The firm provides general investment banking services to companies in the seaborne transportation and oil service maritime industries. In addition the firm provides general corporate finance advisory work in mergers & acquisitions, capital structure considerations, buybacks/dividends, restructurings as well as research focused on public companies and industry statistics. Prior to Oceanaut Capital M.IKE, Mr. Argyropoulos was a Partner of Cantor Fitzgerald & Co through September 2011 where he was responsible for the investment banking group�s activities in the maritime sector. He has extensive investment banking expertise developed since early 1999 in the seaborne transportation industry. From 1999 through early 2004 he was a Senior Vice President with Jefferies & Company, Inc. where he was instrumental in developing their maritime investment banking practice. From 1991 through 1998 he worked in a financial management capacity for a shipping company. Mr. Argyropoulos graduated from the Deree College in 1986 with a B.A. in Economics and from Bentley College, Waltham in 1991 with an M.B.A. in Finance. He is a member of the Beta Gamma Sigma honor society of collegiate schools of business. He is a frequent speaker in global shipping events, contributor to several publications and recipient of a number of awards.